The Los Alfaques disaster was a road accident and tanker explosion which occurred on 11 July 1978 in Alcanar, near Tarragona, in Spain. The tanker truck was loaded with 23 tons of highly flammable liquefied propylene. 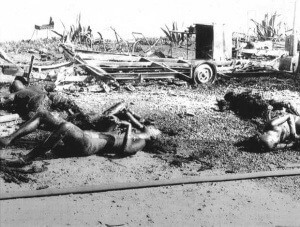 243 people (including the driver) were killed and 300 more severely burned. The truck was owned by Cisternas Reunidas S.A. At 10:15 that day, the truck arrived at the state-owned ENPETROL refinery, located at La Pobla de Mafumet, 9 km North of Tarragona, to be loaded with propylene for another state-owned company, Paular (now REPSOL), from Puertollano. At 12:05 the truck left the refinery carrying 23 tons of propylene, nearly 4 tons over the maximum design load of 19.35 tons. The tanker drivers were under instructions to take the smaller N-340 national road instead of the larger A-7 motorway when carrying cargo to Barcelona, in order to avoid the motorway toll. The N-340 was much narrower and more winding than the A-7, and also carried drivers directly through several densely populated areas. On a summer day with temperatures from 20–35 °C, the pressure in the tank would have been 1,200–1,700 kPa (170–250 psi). The explosion and fireball instantly killed the driver and other people within the area. A total of 157 people died on site as a result of the initial explosion and the subsequent fires and explosions of cars and gas cylinders used by the tourists. Victims were seen with their hair and clothing aflame running into the sea in an attempt to extinguish the flames.